tapestry316: Sometimes it only takes a whisper. Sometimes we have glorious colorful sunsets and sunrises around here. Sometimes the light streams across the entire sky in gold and red lighting up the clouds all across the sky from horizon to horizon. But sometimes we have a quiet gathering of clouds full of soft colors. It’s like a whisper of color that dances on the edge of your mind - a pastel tint of the radiant blazing sunsets. It’s Easter Sunday. Some people are racing around, collecting eggs, having family dinners, and filling the day with bright, flashing, fun events. I’m sitting beside the empty tomb, resting in the quiet of the garden. I am whispering thanks to Jesus who put on human skin, walked through the busy earth, spoke, loved, blessed, and healed many. And we, me – my sins – sent Him to the cross on Golgotha where He died. And the angel answered and said to the women, "Do not be afraid; for I know you are looking for Jesus who has been crucified. He is not here, for He has risen, just as He said. Come, see the place where He was lying. And go quickly and tell His disciples that He has risen from the dead; and behold, He is going before you into Galilee, there you will see Him; behold, I have told you." March is the month for spring, but early spring. Let's explore color in terms of tint. In color theory, a tint is the mixture of a color with white, which increases lightness. We often create with color and ignore tints of color. Create a flowery/botanical/plant project with muted tints leaving lots of white space, if you can. This project is to challenge your thought processes about color, using tints. Don't be intimidated by the absence of bright color. Get creative! Thank you! Happy Easter to you, too! Happy Easter! - Thank you! I love your watercolour painting, Kathy! Thank you, Duni - glad you liked it! Beautiful. Hope you had a good Easter with family! We had lots of fun, Pam - hope you had fun, too! beautiful imagery in words and painting! Love your ability to graciously share your gospel conviction! 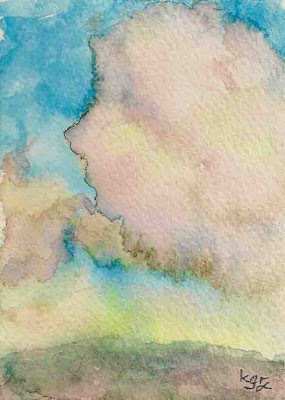 Lovely watercolor--as always! Thank you, Linda! Just one hungry beggar showing another where the Bread of Life is.